The key to uncovering your Irish or British heritage is locating some crucial information about the ancestor who made the trip. In most cases, all of that information can be found in American records. This is Part II in our guide to finding the birthplace of your Irish & British ancestors - an impressive achievement that will unlock a whole new country to research your family in. The trickiest and most vital piece of information you'll need to know is their birthplace in Ireland or Britain. The most likely place you will find this piece of information is in the United States. For the most part, our British and Irish ancestors left the most evidence in the country they immigrated to. Moreover, the savvy genealogist knows that one must start from the present and work backwards – with that in mind, it's clear we must start with American records. It's always best to ask family members about the ancestor you're researching and collect any anecdotal evidence you can find. Family stories are very possibly exaggerated or incorrect, but any information will be helpful for the next steps of research. We're not looking for hard proof at this stage - just for leads. Collect it all! But remember: Do not blindly accept what you find at this stage. You must always validate prior research yourself. Genealogy periodicals hold a wide variety of sources that could help you in your quest, including compiled genealogies (wouldn't it be wonderful to discover someone had already done the work for you! ), obituaries, local histories and court records. Local histories are especially valuable because they may mention your ancestor by name, but can also identify when groups of immigrants arrived and where they all came from. By searching over 8,000 genealogy and history periodicals at once, you'll be able to find relevant information published over the last several centuries. PERSI is especially valuable for colonial research - many 19th and 20th century publications focused heavily on America's earliest immigrants. You'll also find abstracts, extracts and transcriptions of long-lost record sets. For this purpose, discovering an obituary of your immigrant ancestor will be tremendously helpful, since they're often the only complete biographical account of a person. The best obituaries can be found in local community newspapers, usually beginning around 1830 or so, when small town papers began to cover local happenings in more detail. Even if the obituary happens to leave out the birthplace of your ancestor, there will often be other clued of value. 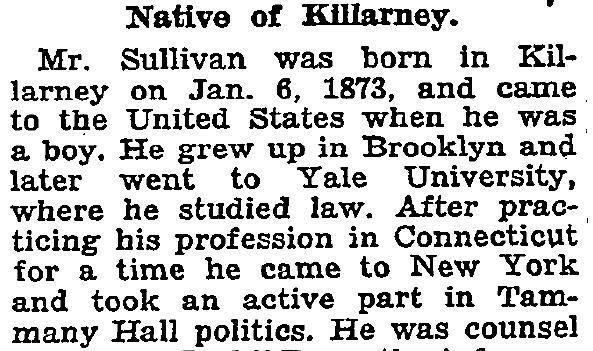 The obituary of James M. Sullivan contained information that helped us find his birth in our Irish Catholic parish records. Read more about this American diplomat who was arrested and imprisoned during the 1916 Rising. Knowing the date or (at least) year of your ancestor's death is vital to this kind of search. Make sure not to get tripped up by location location: Don't just search local papers where they died - if they spent most of their life in a far-away community (perhaps they moved shortly before death), their local hometown paper still may have run something on their death. It's best to look the day after the death and several weeks after that. If your ancestor got married or died in the 20th century, it's possible their birthplace will be listed on official documents about these events - this information only began to be captured after 1900. Although 19th century vital records tend to only contain the country of birth, they will still be be great to find all other information you need, and may provide clues to other records to search. Again, not everything you find on birthplace can be assumed as fact just yet - you can never be certain the information is accurate until you find your ancestor in the records of their home country. Not everything you find on birthplace can be assumed as fact just yet - you can never be certain the information is accurate until you find your ancestor in the records of their home country. It was quite common for an immigrant ancestor to join the military, sometimes even moments after they stepped ashore. The ranks of the Revolutionary War, War of 1812 and the Civil War are especially full of Irish immigrants. Locating a pension application or military service record can be very helpful in discovering information about your ancestor's life before America. The great thing about these files is that they're extraordinarily deep, often providing multiple pages of information. Census records will often indicate if an ancestor served indicate if an ancestor served in the military, and these kinds of things are often captured in family lore as well. If you had an ancestor who served, it's absolutely essential to track down their military records - not only can you find valuable genealogical information, including their place and date of birth, you'll often gain a narrative account of their time in the armed forces. This might seem like the only source you need to uncover the important information about your ancestor's life in their home country, for most it's unfortunately not the case. These records are certainly valuable and need to be on your checklist for this task, but prior to the 20th century it wasn't common for a town of origin to be listed (only a country). Still, the exact content of lists does vary, so it's not impossible to find before the 1900's. Note: Make sure not to confuse "last port of call" with hometown - almost all immigrants had to travel to major port cities to emigrate, meaning there isn't going to be much evidence of their presence in record there. Don't ignore the other passengers on the list. You may notice another family member or friend that appears with your ancestor in later records. Don't let this discourage you though - passenger lists can still contribute to a breakthrough. You will get a exact immigration date, which is helpful, but you should also keep an eye on other names in the list. Perhaps you'll notice another family member or friend that the person appears with in later records. Immigrants often left with neighbors, friends or large groups from their home-town. You may not be able to find the birthplace of your ancestor, but you can always search for their associates and discover a hot lead for the hometown. Hopefully, after investigating all of these sources, you have the information you need to move on to research in another country. Unfortunately for some, it will be impossible to find everything. If you have exhausted all possible options and still cannot find the crucial birth location, don't give up hope! It still may be possible to find your ancestor in Britain or Ireland - it will just take a little more creative thinking and searching.